I may or may not have a problem. I don't know for sure! 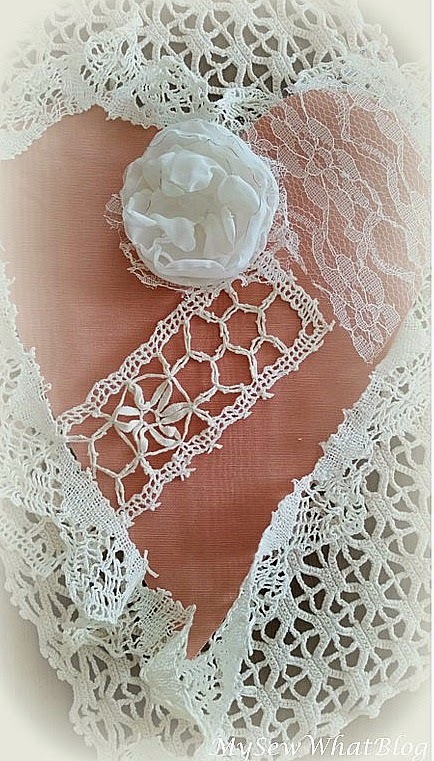 All I know is that I cannot take my mind off vintage linens and lace in all its crisp, white and beige glory. 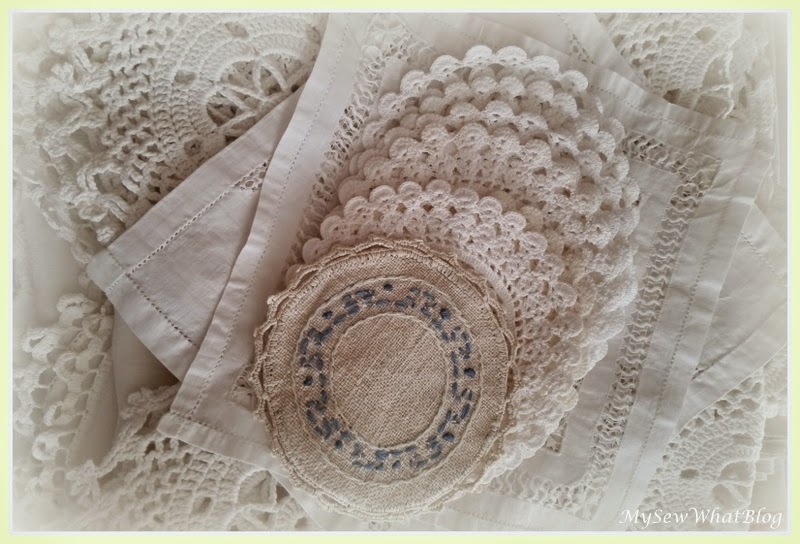 If you have been following me, you know that I found an amazing source for purchasing vintage linens. My initial thought was how wonderful these items would be for reuse in sewing projects. BUT the problem is they are too perfectly beautiful to cut up and I seem to have formed an attachment to them. This is not good! Why? Because I am going to need a bigger linen closet! My first purchase from the antique shop netted many off-white/ecru linens. My second visit is mostly all nice, bright whites. Included are three pieces of beautiful Irish linen, one of which is a long table runner. So beautiful! I washed them all and loved ironing each piece. 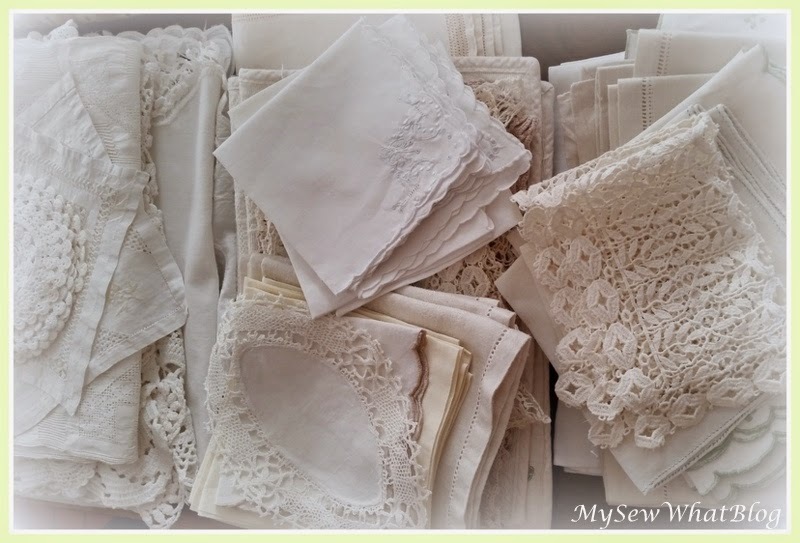 During the ironing phase, I admire each piece and imagine both the creator who painstakingly crocheted lace onto perfectly sewn linen and the users of these fine linen masterpieces. Eventually the thought occurs to me that somebody gave them up, tossed them aside for mere pennies. These pieces already have value to me in the non-monetary sense. I am sentimentally attached and I know not a thing about the creators or the users except the romantic notions I conjure up in my mind while I am ironing. The satisfaction I find in this process is equal to that feeling of losing myself in a good book or movie. A heart pillow in the planning stages.....in pieces...."the before photo"
Last night I did find a lace runner that had a couple of torn threads so I cut it up to use on a pillow. (The pieces are shown above.) It was hard to make the cut.....I think the key is to find less perfect pieces (perfectly imperfect) to use for sewing and crafts. I will keep collecting these perfect, charming and timeless pieces for myself and others who share this love. ps checking back at the antique shop later today! explained by those symbols called words. Their meanings can only be articulated by the inaudible language of the heart." Click here to visit Vintage Inspiration Party!